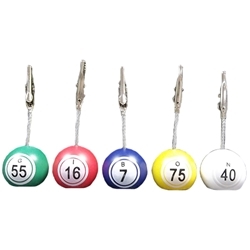 Why not get into the theme of things with a ticket holder that looks like a Bingo ball? These ticket holders are one inch Bingo balls with a flat bottom to stand on. Each is colored one of five colors and each color represents a different letter of Bingo. With stem and clip they stand roughly 3.5" tall.